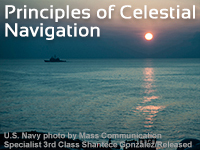 This lesson provides a basic introduction to celestial navigation for navigators, sailors, and others interested in the topic. It begins with the relationship between celestial coordinates and Earth coordinates and examines key celestial navigation parameters—geographic position, sextant altitude, observed altitude, azimuth, and computed altitude—that can be used to identify to a ship's position. A U.S. Navy navigator demonstrates the main celestial sights performed over the course of a day, including the morning three-star fix, morning Sun line, Local Apparent Noon Sun line, afternoon Sun line, and evening three-star fix, and demonstrates how the sight reduction culminates in a marked intercept and line of position on a navigation plot. The concepts of fix, running fix, estimated position, dead reckoning, and assumed position are also discussed. Although no formal background is needed for this lesson, some familiarity with the basics of navigation and the Universal Plotting Sheet will be useful to the learner. Good introduction, the examples by QMC Sheedy were the best part. This course I would recommend to the people that actually use celestial navigation. This is not taught out at sea neither is it even a requirement to our navigational duties underway. Celestial navigation is best taught underway and not in a class room environment. This is more used for last, last resort as a tool for navigation plotting. The plotting sheets that were used, we do not use those at all. This was very informative if were to use this on a daily basis but unfortunately I do not. To Chief's work, good job and thank you for the training. This was a great lesson! Good course. Helps establish the basics for follow on study. When reviewing how to do the work by hand using the plotting sheet is not a true representation of what the work looks like on a chart. There needs to be more review of how to accomplish the same work using the Sight Reduction Tables and HO Pub 229 and the Rude Star Finder, not everyone is comfortable using those materials. Good introduction to celestial navigation. I thought the lesson was very well put together and easy to navigate through. One of the best presentations of the important concepts of celestial navigation on the internet but as a practical guide to CN it falls short. As it acknowledges, in order to use the information you need an internet connection, difficult in the middle of the Atlantic. Could use just a bit more explanation on the running fix and what is going on to advance lines for solar measurements and subsequent plotting. Very intuitive and easy to follow. I went through it a couple times and was able to learn the theory and nomenclature of celestial. This course was very instructive and provided excellent examples of the use of the concepts. Chief Sheedy is the man! Promote to Senior Chief NOW!!! This lesson brought me back to the basics of celestial navigation. The US Navy should implement this course onboard ships across the entire fleet. I strongly believe that Junior Quartermasters would benefit from a course like this. Great course, helped me understand the concept of celestial navigation more. Very informative. cant wait to practice it more on merchant vessels. I've learned a lot of useful techniques necessary for navigation. This was a great course, helped increase my knowledge of celestial navigation having very little instruction previously. These lessons are good as a refresher for experienced Navigators and beginners. I highly recommend this course. Name the coordinates that define a location on Earth, a location on the sky, and a location as viewed from the rotating Earth. Define "geographic position" with respect to the position of a celestial object. Define zenith and zenith distance. Describe how one measures zenith distance. Describe the relationship between zenith distance and geographic position. Define lines of position (LOPs), and what intersecting LOPs determine. List the steps that a navigator performs as he/she plots lines of position; describe how to plot LOPs on a chart. Summarize the accuracy of positions determined using celestial navigation. List some advantages and limitations of celestial navigation. List the information required to obtain a celestial navigation fix. List the instruments required to make an observation. List the necessary corrections to a sextant measurement, also known as sextant alitude or Hs, to produce an observed altitude or Ho. Describe why an "assumed position" is used. Describe how to calculate the intercept distance using Ho and Hc. Describe how the intercept distance, azimuth, and the moniker HoMoTo are used to plot a LOP. Describe the special publications used to determine Hc and Zn of an object. Describe the contents of The Nautical Almanac and Pub 249, and how they are used in sight planning. List the different navigational sights taken during a 24-hour period on a naval passage. Define the concept of a running fix and explain how to plot it. Describe how mid-morning and mid-afternoon sun sights can constrain a running fix. Summarize the concept of a Local Apparent Noon Sun sight, and how it can yield a fix.